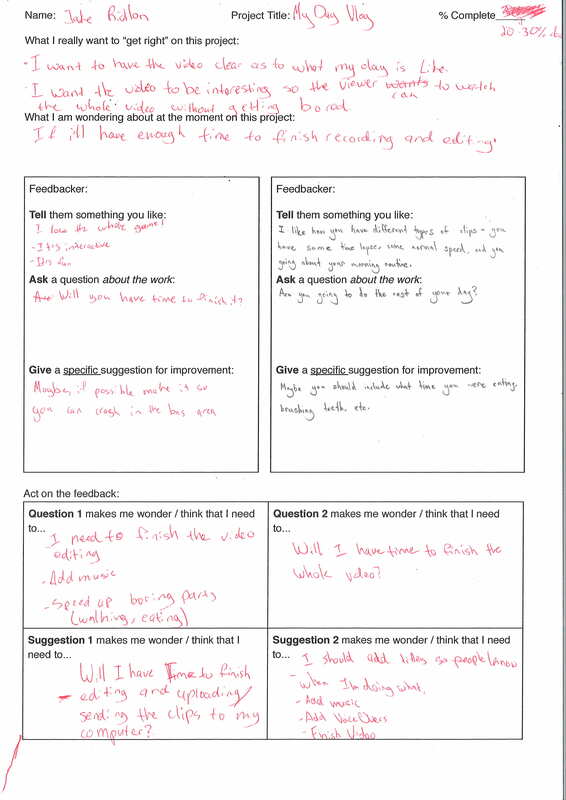 Jakes amazing blog! – "Everything negative- pressure, challenges- are all an opportunity for me to rise" said Kobe Bryant. "Everything negative- pressure, challenges- are all an opportunity for me to rise" said Kobe Bryant. Our target audience is parents, teachers, possibly students, some schools, and some companies. We are selling name planks to possibly teachers and companies who need a reusable biodegradable name plank. Students who are moving away might want a plank with their school’s logo/mascot on it. Parents might want a certain photo on it or an inspirational quote on a plank. You can help us improve and collect more market research by filling out this survey. 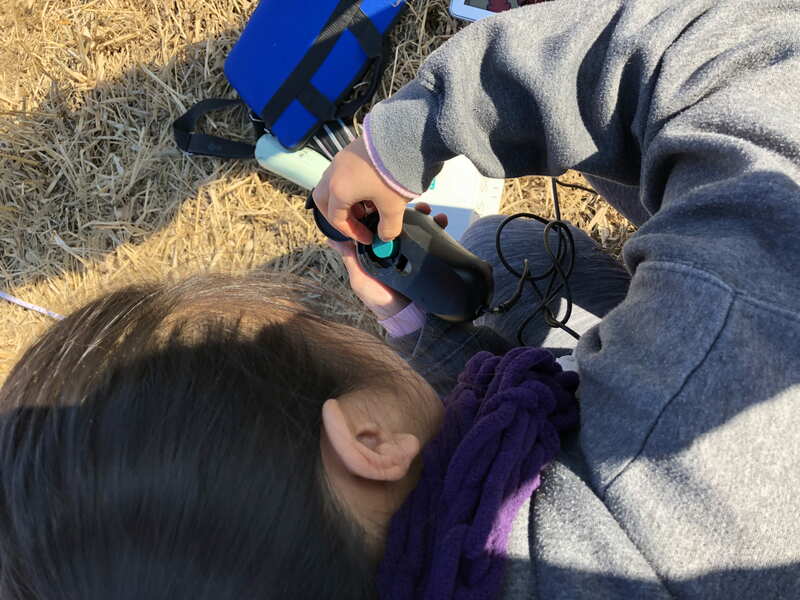 April 8th, a Monday, first day after the week-long spring break vacation, FA takes several busses down to the WenYu river to collect out data and later to make this field study blog post. The weather was cold but getting warmer. The last visit, the water level was a lot higher, for some reason the water level of the river was a lot lower this trip. All around the site, we saw flowers growing in and trees budding, this is a sign of spring. In this photo, I am throwing a stick into the river so we can measure the flow rate. In April the, River’s water level was a lot lower, thus resulting in a lower flow rate averaging 0.073 meters / second, last time the average flow rate was 0.222333333 meters / second. We think the lower water level might be because of a Dam up river, perhaps the water flow was being controlled by someone. A repeating trend is that when the weather is colder the flow rate is slower, it seems as if it was colder today than last time, but this time flow rate was the lowest average, and this was definitely not colder than some of the winter days. The Turbidity was shown no obvious pattern, although, we can tell that September has had the lowest turbidity and it was increasing until is reaches 103, then it dropped back down to an average of 57.5 NTU and Aprils average was 64.7 NTU. Next time we collect data, I wonder if the flow rate will average higher or lower than this time. I think it will be a lot higher due to this trips unexpected low water level, once the water level goes back up the flow rate’s average should to. Next time we collect data, I wonder if the Turbidity will average higher or lower. I think it will be higher because this trip the flow rate was slower, slower flow rate means less turbidity, and since I am expecting the water level to rise as well as the flow rate, the Turbidity will also naturally rise as well. Looking back on Project ReCharge, I learned that there is no simple solution to solving child labour as the issue is too complex. For example, on Thursday during the board meeting, after several hours of work and negotiation we still ending with 5 proposals that we could not agree on, so in the end we sent a list of the 5 proposals to Mr. Hurworth, so he could choose. Before this project, I used to think that child labour was alright as long as they are not being abused, now I think that child is in no means acceptable because child labour in itself is abuse. For example, if children are working then they cannot get an education, without and education they cannot get a real job, without a real job there will not be enough money to support their family and they will have to send their children off to work. That is an endless cycle that repeats for each generation. 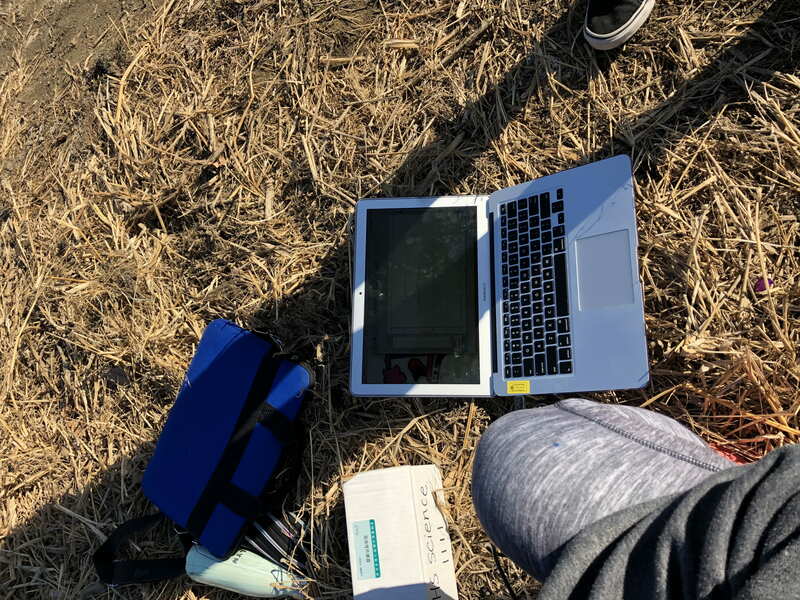 Today it is March 7th, Field Study! 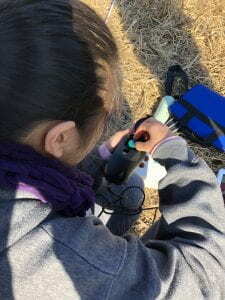 Today we went back to the WenYu river again. The Purpose of this trip was to collect data on the turbidity and flow rate of the river at the moment. The weather was quite cold although it is heating up, the past few trips were so cold even a jacket wasn’t enough. 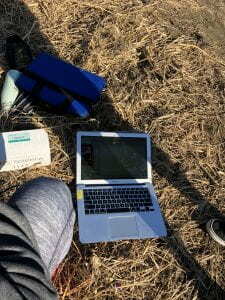 In this photo, the computer is measuring the Turbidity (NTU) from the lake’s water. Next time we collect data, I wonder if the turbidity will be higher since the turbidity is showing an increase from an average of ___ to 56 NTU. -I notice that the Turbidity has decreased since the last Field Stuy in January. The turbidity average was 103 NTU in January and Now it averaged 57.4 NTU. I am curious as to why the turbidity is higher because if the flow rate is increasing I would assume the turbidity would as well. -So far I notice that the overall trend is that the flow rate is increasing and naturally so is the turbidity. This time the flow rate is averaging 4.8666…7 seconds / 1 meter. Last time the average was 7.43333… seconds / 1 meter and the time before that the average was 5.613333… seconds / 1 meter. In November the flow rate was slowing down and then in January, the flow rate was really slow. At the moment the flow rate is speeding up. I wonder if this is because of the ice from winter melting, the reason this would make sense is that there is more water to flow, therefore the flow rate becomes higher. My final product is a Vlog of the average day in the life of a middle schooler living in China. In this video I walked the viewer through what my day looks like, I went through what time stuff happens and I gave a description of the class and what was happening. I added background music and voice-overs when needed. To complete this project I had to bring my camera with me everywhere I went so I could video important things. I didn’t catch all of my days because after school I had a doctors appointment downtown so there wasn’t much to record. During the process, I learned that in order to make a good video the whole video needs to the smooth and the music absolutely has to fit the mood. I don’t think I did a very good job on finding music that fit the mood of my video and the final product was probably not as good as it could have been if the music fit the mood of the video and there were more clips to put into my video. The L21 area that U focused on was Creativity and Innovation because in order to have a good video you need to be creative and decide what fits in the video and what clips should just be skipped. To meet this goal I had to look through a lot of songs on YouTube that were not copyright so I could use it for my video, the challenge was finding one that fit the mood of my video. Another challenge was deciding whether or not something fit into the video. Some skills I gained from this project include adding filters to certain clips when they were too dark or didn’t contrast with the other clips, I also learned how to fit in the music to make sure the music can be heard but when someone is speaking it is faint in the background so it doesn’t interfere with the voice and they can still hear everything alright. This skill will benefit me in the future if I ever need to edit a short video and give it a lot of meaning. Overall ignite week helped me because making a video was very fun and on top of that I learned a lot of new skills in terms of movie editing. 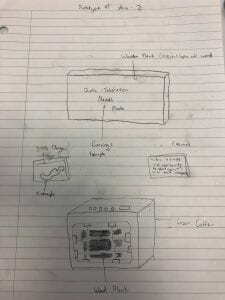 During this project, I will need to use a camera to vlog the video, and editing software to edit the video. Some other basic things I could use is a selfie stick/tripod and headphone. A Tripod will allow me to get a better grip on the camera so I can hold it from different angles. Headphones will allow me to find the right places to cut the clips and where to start/ add the next clip. I will need to learn how to use iMovie and use special editing tricks to make the video more interesting. For example, I need to learn how to use a timelapse and where to use it, I also need to learn how to add in the right music to fit the mood and where to add it. I plan to use a certain song for the whole video depending on the mood of the video. I will use A time lapse in any place where I am doing something that takes a long time. Based on the feedback I have received I will add music to my video so it makes the video more meaningful. I will add VoiceOvers to explain what I am doing, I will add titles to my video they the viewers know what time and what is happening. And finally I will Finish the video by adding the other clips and finishing the edit. During this Ignite Week project, I am creating a video where I will vlog everything I do from when I wake up to when I go to bed. This video will be used on Friday for my final exhibition. When making this video I hope to have a final project that is interesting for the viewer and is engaging, I don’t want the viewer to get bored halfway through or at any point in the video. I watched a few videos today that were interesting all the way through and a few that made me bored very quickly. Looking back on Collision, I learned that to make a reliable delivery system we need accuracy and reliability. For example, for accuracy, we used an evenly strung parachute to drop our package from a drone. Regarding reliability, I mean having the package delivered in good shape (Not Broken) and the product inside is also in good shape. To complete this, we used the parachute to slow down the package. I learned that the parachute needs to be bigger than the box for it to slow down because with Fnormal pushing up, the larger the base, the more resistance is present. Before this project, I used to think that one design was enough and one drop is all we need, but now I feel that we need several models and several drops. For example, if we have many drops we can get an average idea of what the real data is because the first drop might be inaccurate and we won’t get a measurement, so we need many so get the most occurring of the drops. If we have accurate data, then we can make meaningful changes to the designs, and each time we create a new design there will be something wrong with it, so we test it, collect data on it, and change it until t is perfect. Looking back on Collision, I realize that something falls because gravity is greater than force. Some things fall faster than other because some things have more significant bases than others. When something is falling it is because gravity is pulling it down. The reason it is not instant is because a force is repelling it. That is why a parachute works. Since there is less mass the gravity is pulling it down less and with a parachute taking the resistance it slows down much more. I chose to do this because going up normally was easy and I wanted to challenge myself by going up backwards. This was challenging because I could reach any of the rocks in the middle and that means I had to smear a lot to get to the pieces I wanted to reach. During this climb something I did well was utilize the climbing methods to get to the top, for example, I used the back step to reach a rock that I could not have reached otherwise. What did you learn? Discover? I learned that smearing is very useful if you can’t reach a rock but you are stuck in a place. I used this in the chimney when I smeared on the walls to get to the top. 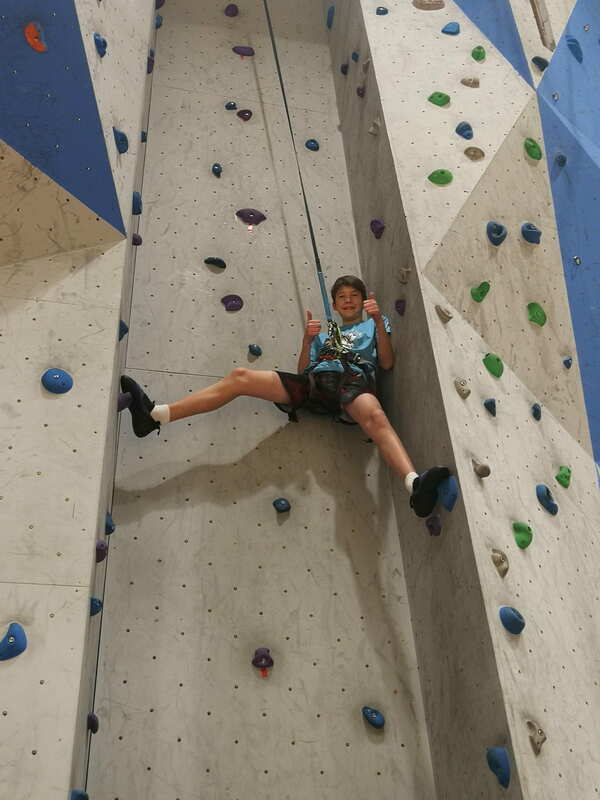 A challenge I faced was when I was almost at the top and I had to turn around so I could fall down, this required me to really stretch out to the other side of the wall so I could turn arounds, then I went back to the other side and dropped down. 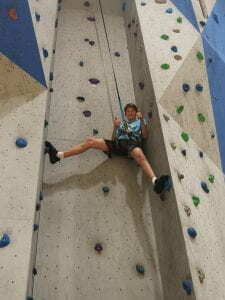 One Day is important to me because I enjoy rock climbing and this was a chance to try it and get some practice. 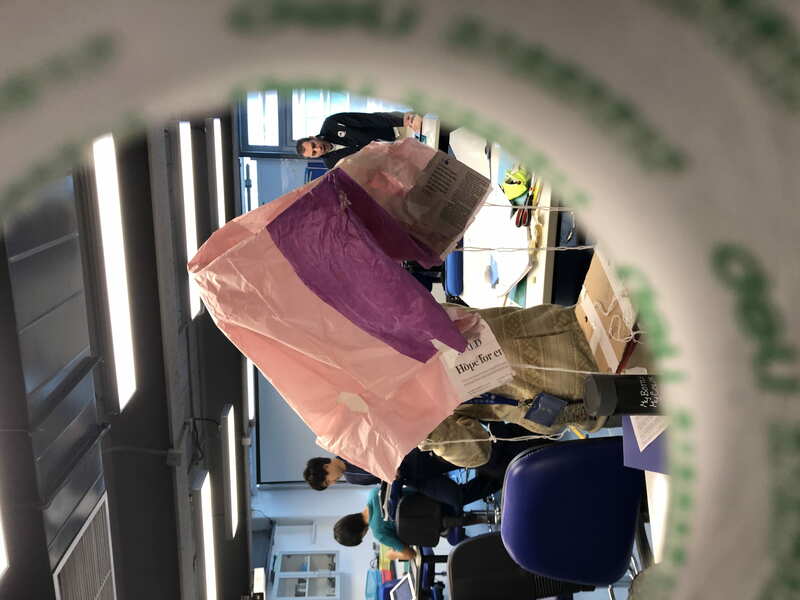 Our team constructed the first design using a cardboard box, string, hot glue, tape, and thin gift/ wrapping paper glued together. Multiple drops took place, and we noticed that the gift paper ripped many times and the box kept breaking, this happened so often it was really frustrating. Inaccuracy- Drop 2 was 180 cm away from the target and drop 3 was 150 cm apart from the force plate. This is because of the gift paper, due to the glue the paper kept ripping and holes would form. So it would drift to one way if a hole formed in a corner. Box breaking- Several times the box would break, and we would end up having to retape the entire package, this was very wasteful as every drop the box would fall apart, and we would have to retape. After we added the parachute the accuracy decreased so, unfortunately, the package did not hit the force plate any of the drops so we didn’t get a reading on the force. Time/Speed- Our falls were quite slow. 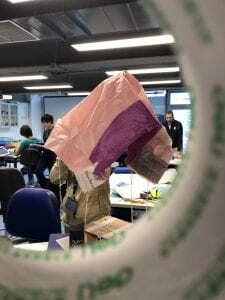 As the parachute did not do so well in terms of accuracy, it did its job in slowing the package down. Drop 1 was 1.07 seconds and drop 2 was 1.18 seconds, drop 3 was fail in the parachute ripped and got holes, so it fell in 0.68 seconds. 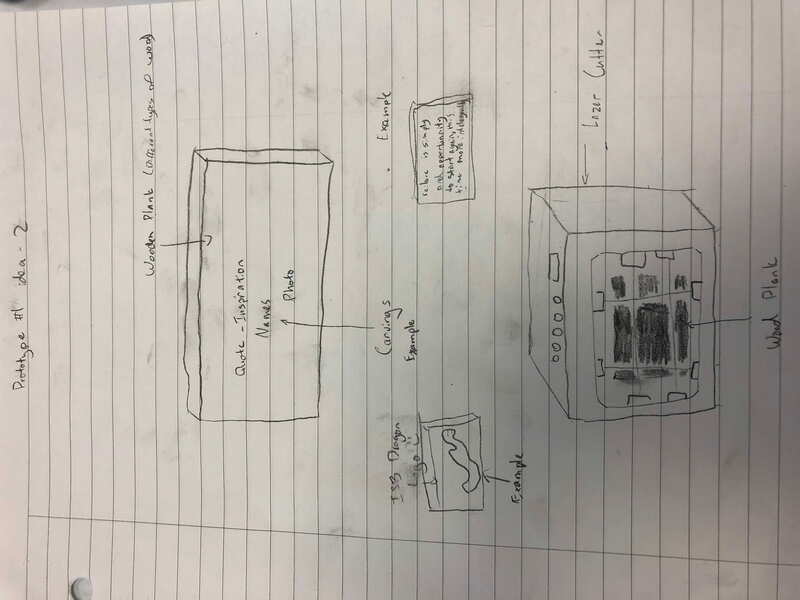 For our next design, we want to improve upon accuracy, speed, and safety of the box. We will do this by adding a stronger more solid parachute, for example, a trash bag because they are big and they don’t need to be taped/ glued together. We will make the ends or strings that are tied to our box more equal in length and even out the weight of the inside of our box. We will also try to get a new box or just tape it together for one more design. 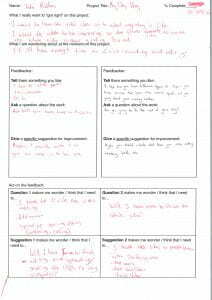 © 2019 Jakes amazing blog!